Employees of the supermarket chain Nakumatt stock shelves in Nairobi, Kenya. As the French giant retailer Carrefour opened its doors in the leafy Karen suburb of Nairobi last week, it seemed like just another multinational finding its footing in a thriving African city. But the launch represented something more significant than a few more aisles of food and products targeting Kenya’s newly minted middle class families. Carrefour is one of at least three international players that are looking to shake up Kenya’s family-run private retailers which have dominated the supermarket scene since the exit of the British colonialists over half-a-century ago. Not to be left behind, Walmart, through Massmart, its South African subsidiary opened a branch at the Garden City mall in Nairobi last May to also target the growing wealthy class of shoppers in the bustling city. Armed with cash raised from listing on the Johannesburg Stock Exchange, Choppies, a leading retailer in Botswana acquired 10 branches of Ukwala Supermarkets in Kenya, a successful purchase by a foreign entity of a family-owned supermarket in the country in recent years. Ukwala had in 2013, sold three outlets in Nairobi to Tuskys, handing the latter strategic locations in the Central Business District, prior to Choppies’ entry in Kenya. As the middle class rises, with less time to haggle in local markets, the transparency of formal retail becomes attractive. At the release of financial performance for 2015 in March this year, Choppies management said the Ukwala acquisition offers an excellent footprint for expansion across Kenya and East Africa. With 10 branches, the retailer looks to continue the same appeal that Ukwala had in the market before it backed out: low-cost, value player in urban locations. 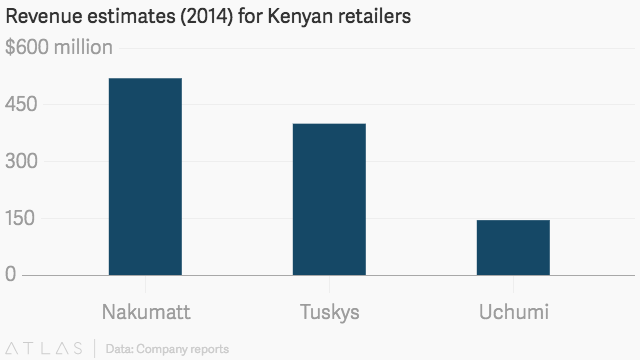 This is a market that all the local retailers, except Nakumatt dominate. “We welcome these players to this market as it serves to confirm the viability of the local and regional formal retail market,” Thiagarajan Ramamurthy, Nakumatt’s regional operations and strategy director for East Africa, tells Quartz. With countries such as South Africa boasting of a more mature and sophisticated retail sector, investors have been looking to the markets in East and West Africa for expansion. Like other African countries, Kenya’s economy is dominated by the informal sector. But, as the economy expands and the middle class rises with busy city dwellers having less time to haggle in market places, the transparency and efficiency of shopping in retail outlets becomes more attractive. The country’s retail sector remains one of the most advanced yet attractive in Africa, with a penetration level of between 20% – 30%. The sector’s potential is estimated at over $7 billion, a figure which would hardly escape the eye of any prospective investor. Nakumatt, East Africa’s largest supermarket, currently generates an annual turnover of about $700 million in retail sales but anticipates this figure hitting the $1 billion revenue mark at the end of 2017. “There is a great opportunity for growth considering the fact that the penetration of retail market is still low … close to 70% of Kenya’s retail segment is informal with the formal retail market which is dominated by local and family-owned brands constituting 25-30% of the market,” analysts at Nairobi-based Cytonn Investments say. Many supermarkets in Kenya today started as small shops in the 1960s soon after the country attained independence from Britain. They dealt largely in the sale of groceries or apparels. Pioneers such as Nakumatt and Chandarana, were started by Kenyans of Indian descent and traded under different names at the time but have grown to become household names. Tuskys and Naivas were established by two Kenyan brothers, in the 1970s as small retail shops. The two have expanded to command the second and the third largest positions in Kenya’s retail sector in that order. In a distant fourth is Uchumi (a Swahili word for economy) that was established by the government in 1975 to promote the ‘buy Kenya’ mantra through distribution of locally made products. The informal retail market dominates in Kenya but that is slowly changing. But, behind the history of the growth of Kenya’s retail chains lies the reality of murky waters that some have waded through in the name of family feuds and corporate misconduct. In recent years, the infighting at Tuskys and Naivas has unraveled several deals in which some directors have been accused of cutting with external buyers, albeit unsuccessfully. The family tussle at Tuskys in 2012 was, for instance, linked to potential hostile take-over by an un-named retailer in the UK, but which never materialized. Naivas has also had its fair share of family feuds. More recently, one of the siblings accused his brothers of secretly conniving to sell a major stake in the retailer to an unknown buyer. Thanks to the intermittent family feuds, attempted acquisitions by foreign supermarkets such as Massmart have in the past proved futile. This is why Massmart elected to start its Kenyan operation, Games Stores, organically after a deal to acquire Naivas flopped in April 2014. The sector’s potential is estimated at over $7 billion, a figure which supports the interest of prospective investors. Despite the challenges, local retailers have particularly maintained dominance due to a strong brand heritage and visibility that have garnered them devotion among shoppers. “(This is) largely as a result of their strong brand heritage built over time through strong advertising and their long-term presence in the market. Also, the expansion of modern retail outlets to residential areas has enabled a wider consumer reach,” a report by Euromonitor released in January 2016 states. With growing competition, consumers are inundated with a volley of loyalty schemes targeted at rewarding faithful shoppers. Nakumatt was the first to roll out such loyalty schemes, with the rest following in quick succession, further intensifying competition for the pockets of the shoppers. Further, the push by retailers improve supply chain efficiencies, ramp up their discount offering and introduce advanced technology to lower costs of doing business is now the norm. All the while, the customer remains king and can easily vote with their feet by simply walking away should the service on offer rank below their expectations. Meanwhile, a bunch of much smaller indigenous retailers such as EastMatt, Mulleys, QuickMart, Mathais, CleanShelf and GreenMart have sprung up in urban settlements and towns across Kenya, ramping up Kenya’s formal retail sector. But, beyond the convenience store approach that retailers such as Uchumi and Tuskys have adopted to fight back competition from the small retailers, players such as Nakumatt are more focussed on advancing the “supermarket and hypermarket formats” across East Africa.